Source: U.S. Energy Information Administration, based on Form EIA-860, EPA Continuous Emissions Monitoring System, Ventyx Energy Velocity. Note: Circles denotes plants with capacity greater than 25 megawatts. Red circles are unscrubbed coal plants, green circles indicate coal plants with scrubbers, and blue circles indicate coal plants that plan to add scrubbers. Coal-fired electric power plants make up the largest source of national sulfur dioxide (SO2) emissions. The Cross-State Air Pollution Rule (CSAPR) calls for a 53% reduction in SO2 emissions from the electric power sector by 2014. To meet this goal, plant owners can implement one of or a combination of three main strategies: use lower sulfur coal in their boilers, retire plants without emissions controls, or install emissions control equipment—primarily flue gas desulfurization (FGD) scrubbers. Plants with FGD equipment generated 58% of the total electricity generated from coal in 2010, while producing only 27% of total SO2 emissions. SO2 is formed during the combustion of coal. The amount of SO2 produced depends on the sulfur content of the coal burned in a boiler. FGD scrubbers remove the SO2 from a boiler's post-combustion exhaust (flue gas) by passing it through an alkaline solution. This process is also effective in removing acid gases, such as hydrochloric acid. Acid gases are expected to be regulated under EPA's Air Toxics Rule. FGD scrubber SO2 removal rates vary based on characteristics such as the specific equipment type, age, and the sulfur content of the coal. New systems have the potential for removal efficiencies of up to 98% according to EPA estimates. The sulfur content of coal varies by rank. Generally, bituminous coal and lignite coal have higher sulfur content than subbituminous coal, but this can vary by region. 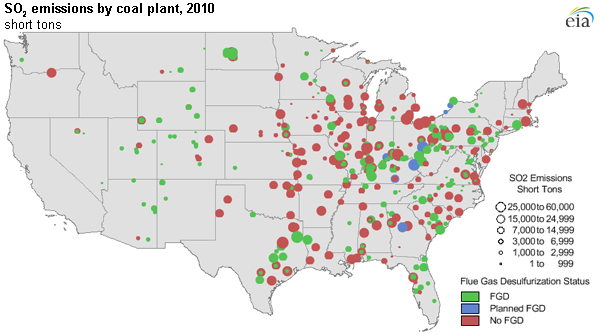 Bituminous coal is concentrated in the eastern half of the U.S, while subbituminous coal can be found in the west. Lignite production is concentrated in Texas, Louisiana, and North Dakota. Source: U.S. Energy Information Administration, based on EPA CEMS 2010 data. Note: Graph includes generation and emissions from plants with capacity greater than 25 megawatts. Subbituminous coal has the lowest sulfur content of the three main coal types, so plants that burn subbituminous coals have been less likely to add scrubbers. Of the plants without scrubbers, the ones burning subbituminous coal generated 69% of the electricity while only emitting 48% of the associated emissions in 2010 (see chart). Even though lignite-burning plants accounted for 16% of SO2 emissions from scrubbed plants in 2010, they generated only 8% of the electricity from scrubbed plants.